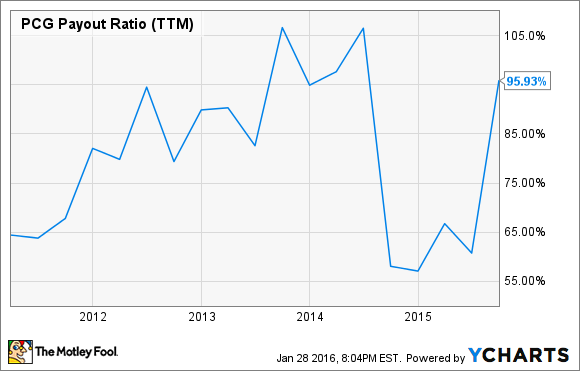 Will 2016 Be PG&E Corporation's Best Year Yet? Can PG&E Corporation continue to soar in 2016? So far for 2016, the stock market is off to one of its worst starts ever. But PG&E Corporation (NYSE:PCG) has defied market trends and is in the black. With 11 months ahead of us, investors need to know whether PG&E stock will continue to rise. Here are three reasons 2016 could be PG&E's best year yet. The EPA Clean Power Plan has officially gone into federal effect, and utilities are scrambling to understand what it means for them. Illinois-based Exelon Corporation (NYSE:EXC) is the largest nuclear producer in the United States, but the future of its nuclear notions will be significantly affected by how Illinois decides to comply with the plan. If Illinois decides to ditch nuclear support or doles out sizable subsidies to other alternative energies such as wind, around one-third of of Exelon's generation portfolio will lose out. PG&E is similarly exposed to California regulators. But unlike Exelon Corporation, PG&E is ahead of the game when it comes to clean power compliance. California Senate Bill 350 calls for a statewide target to generate 50% of its electricity from renewable sources by 2030. For PG&E, a quarter of its energy portfolio already meets renewable-energy standards, and 55% is greenhouse gas free. These forward-thinking assets will keep capital expenditures down for PG&E as other utilities struggle to go green in the years to come. Utilities depend on regulated earnings to bring in steady sales. Last September, PG&E Corporation submitted a request to the California Public Utilities Commission that will decide whether the utility is allowed to increase rates by about $4 per month for an average residential customer. PG&E expects the commission to decide by the end of the year, and its verdict will determine PG&E's volatility in the years to come. The corporation currently pays out essentially all of its earnings in dividends, and a failure to raise rates could mean a reduced dividend or delayed capital expenditures. But if the request gets the regulatory thumbs-up, PG&E Corporation will get busy with its extra sales and invest more into its distribution and generation businesses. California's energy portfolio presents both challenges and opportunities for PG&E. It has more than 10 times the solar power capacity of any other state, and California's energy goals also include calls for energy efficiency and transportation fuel cuts. Rather than fight legislation, PG&E is asking for the funds to push this progressive frontier. In the same way Exelon Corporation has pushed for its own grid modernizations to account for new natural gas sources, PG&E is ready to welcome renewables to the scene. It's requesting $1 billion to invest in what it calls "The Grid of Things," a system that can handle the unique demands of a more dynamic energy portfolio. In general, the utility plans to keep up capital expenditures through at least 2019, investing between $5.3 billion and $6.5 billion annually. At the same time, its (expected) expanded rate base will allow the company to continue to grow its earnings at a compound annual rate of 6% to 8% -- music to an income investor's ears. PG&E may be gearing up for its best year yet. But there are still risks to consider, and investors should do their due diligence to know why PG&E stock could just as easily fall in 2016. A balanced perspective enables a balanced portfolio, and the wisest investors want to be sure they know exactly why they're holding for the long haul.